Samsung held on to its crown of the top global smartphone vendor last year amid intense competition from its rivals. It still stands tall above the rest when you look at the sheer numbers that it’s shipping out. The contraction in the overall smartphone market has hit its biggest rival Apple as well. Both companies saw a decline in shipments for the complete year. It’s a different story for Huawei which now expects to become the top vendor either by the end of this year or 2020. Its shipments surged a whopping 34.5 percent compared to just a year ago. 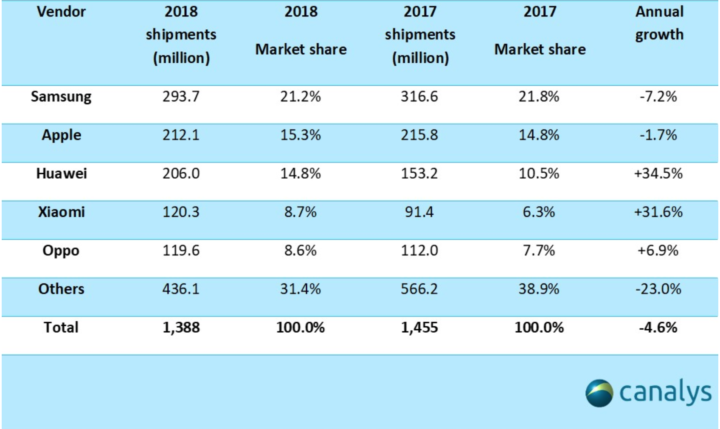 Huawei shipped 206 million units in 2018 and came third on the list of top vendors. 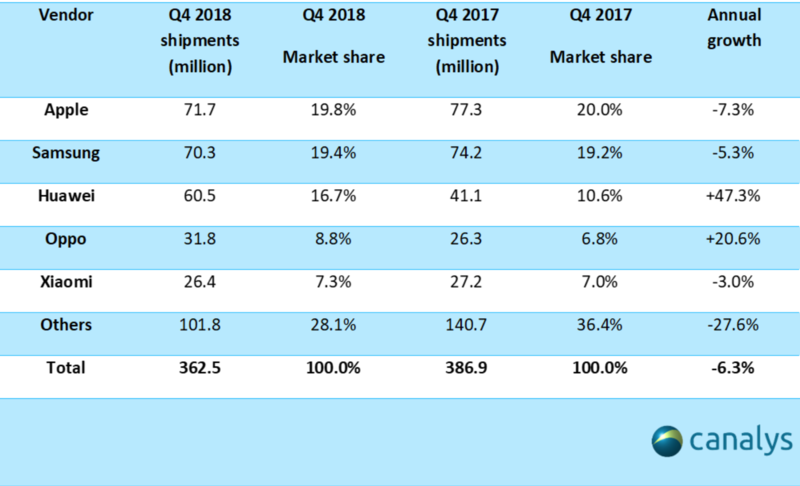 The latest data from Canalys shows that Samsung shipped 70.3 million units in Q4 2018, a decline of 5.3 percent compared to the same period last year. Apple was on top with 71.7 million units despite a 7.3 percent decline. Huawei posted an impressive 47.3 percent year-over-year growth to ship 60.5 million units. Apple did overtake Samsung to become the largest vendor this past quarter. The Korean giant reported its Q4 2018 earnings today and mentioned that its numbers are down due to the overall sluggish smartphone market. Not to mention the fact that iPhones tend to do better in the holiday season compared to Samsung’s devices. IDC, another research firm, has reached a different conclusion. It puts Samsung at number one in Q4 2018 shipments with 70.4 million units and Apple in second with 68.4 million. Huawei comes in third with 60.5 million units. Such discrepancies are common as different firms have their own method of tabulating the numbers. Samsung remained the top global smartphone vendor for the whole year, according to Canalys. It shipped 293.7 million units in 2018, registering a decline of 7.2 percent year-over-year. Apple remained in second place with 212.1 million units and a 1.7 percent decline. Xiaomi also exhibited strong performance in fourth place with 120.3 million units shipped and annual growth of 31.6 percent. The company is now hoping that the Galaxy S10 will improve the fortunes of its mobile division in the first quarter. It’s also relying on foldable and 5G phones due this year to increase shipments and revenue. Big jumps followed by big dives dear Huawei. Samsung don’t know to lose.